We had checked into 1 of 2 hostelrias in town, where we were pleasantly surprised by electricity for most of the day, along with cable TV. There were 2 French tourists there as well – they had been dropped off at the Ollague border when their tour operator couldn’t make it back to San Pedro due to the weather. With the road closed, they were stuck too. The girl, who we now refer to as Drama, had a flight to France in a few days and had to get to Santiago – still a 20 hour bus ride away from the next big town. They asked us for a ride when the road opened. She had already spoken to the police and even to town mayor and was intent on getting the road opened by will power. Sure thing. The next morning, it was still snowing. The other drivers stuck in town came to our hotel for breakfast and said it would be another 2 days. Most of them had already been here 2 days. I mentioned it to Drama and she cursed and stomped off to cry. We pulled out some things from Red Beard and figured we’d be snowed in a few days. Every sock and shoe we owned was soaked and salty, so we took advantage of the now working electricity and laid everything out in front of a space heater. Possibly the first heater of any kind we have seen since we’ve been in the Andes – we’re going to like Chile. About 11am, the woman running the hostel knocked and said the police had opened the road for now, but it may be closed in the afternoon. The police were at the end of the street, and we should follow them. We threw our stuff back in the bus, told the French couple we were leaving and then asked where we could get gasoline. The hotel sold it, so we bought 10 liters (about 2.5 gallons) from them for the equivalent of $30 USD. That and the hotel cleaned us out of the Chilean pesos we had with us, and there was no ATM in town. 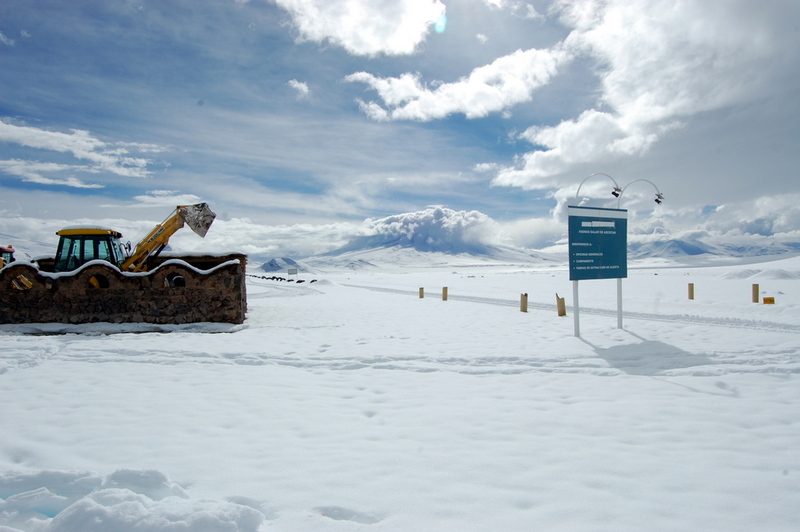 Oh well, if the road is open there was money in Calama…200 km away. Once we were all stuffed into the bus, we found that the police had already left, but there were tracks for us to follow. We only got about 15 minutes down the road when Red Beard began acting funny. No power. We deduced it must be the gas – it was running fine until we put in the hotel gas. The snow was deep and there wasn’t an easy way to turn around. We thought maybe we could catch up with the police, but didn’t see them at all. There wasn’t much we could do back in Ollague, they maybe had bad gas, we didn’t have any money and we could get stuck there for a while. 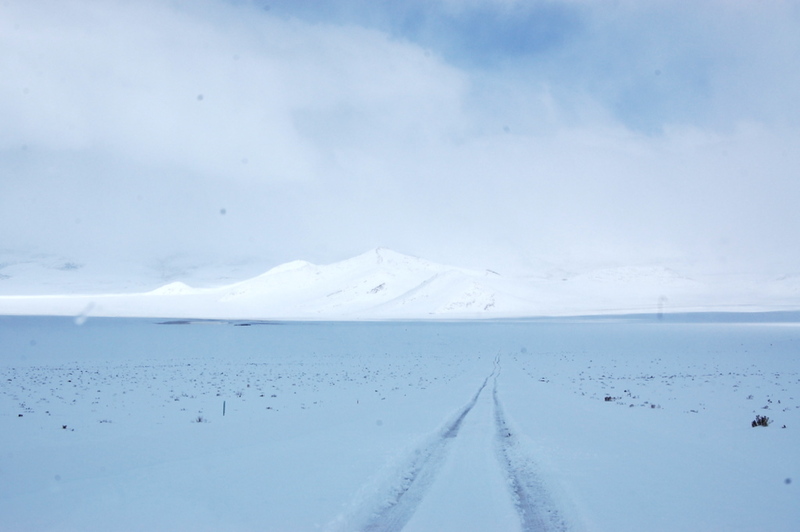 The town on the Bolivian side was so small that I didn’t even see it, and I’m not sure there was a town. We chugged and chugged along slowly, Jason flooring the gas just to keep in motion, until we got to an incline we couldn’t get up. As luck would have it, that is when the guys from breakfast pulled up behind us…5 guys in their car. We told them the problem, they nodded and told us we could make the next town. Only a couple inclines before it was all downhill to Calama. They pushed us up (a few times) and then another car came along with more help to get us up the biggest peak. We asked about turning around, but they were very encouraging. Eventually we got to the small ‘town’ we were headed to. We pulled over and the 2 cars blew by us…happy for us to be out of their way. With Jason flooring the gas and the high altitude, we burned through most of the tank. It wasn’t a town, it was just a couple buildings for a borax mining company, with about 5 guys working there. They were super nice and even fed us, but they had no gas. The next “town” was a police station at the top of the pass and maybe they’d have some. Regardless, we couldn’t make it any higher. Their boss was headed up to get them in an hour or so, and maybe he would have some gas. Jason drained out the remaining ‘bad’ gas, and put in the 2-3 gallons of good gas we had in the tank and then did a full tune up. We still had 165 km to Calama. One of the workers came over and put some of the siphoned gas in the cap of our can and swirled it around like a sommolier, sniffed it, and declared it 93 octane. He then did the logical thing and looked at it – and pointed out the little water bubbles floating around in it. His buddies came over and all agreed that of course we got bad gas – what else would we have expected from a hotel? Meanwhile, the French girl used their phone to call a tour agency. 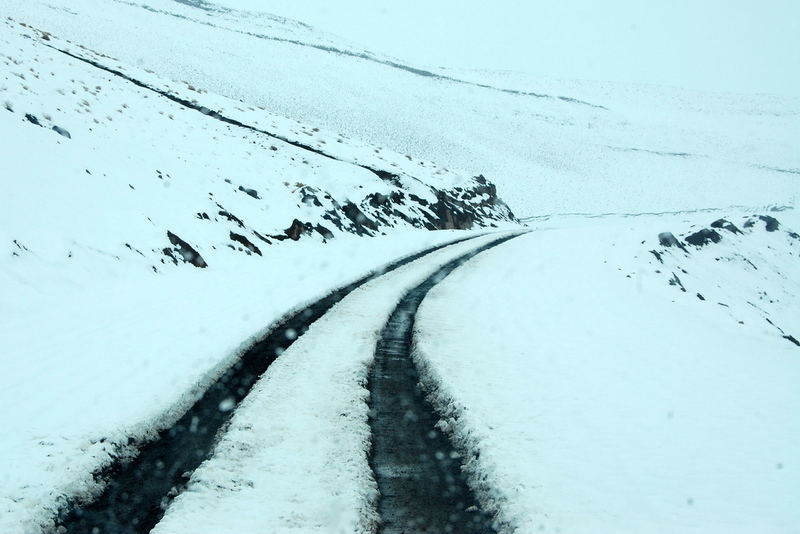 With enough whining, she eventually got them to agree to come pick her up at the police station at the top of the pass – it would take them 4 hours. 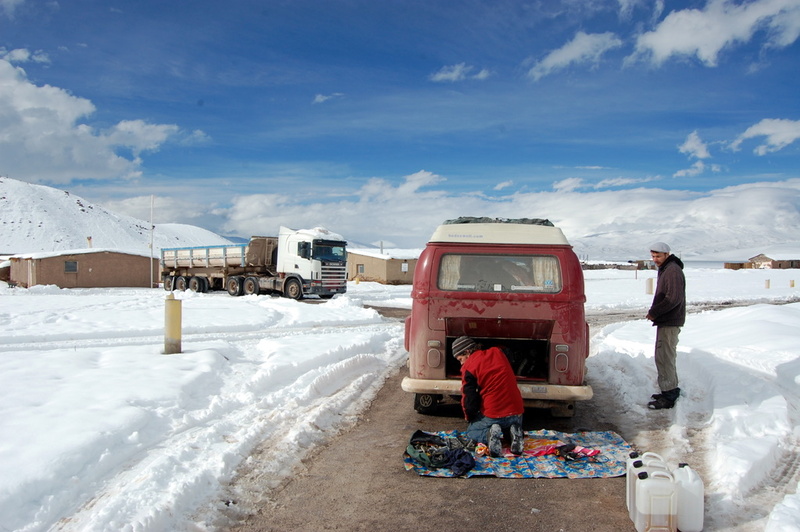 We waited in the cold for 3 hours for the boss to show up and then the crew magically found 4 liters of gas to give us. The truck driver was going to leave in 1 hour and would pull us if needed. Since it was late in the day, we went ahead and headed off with our 4 liters of gas, to the police station which was only supposed to be 30 minutes away. Still, we ran out of gas. We added the bad gas back in and chugged up. We pulled into the police checkpoint (with 3 of us getting out and walking so Jason could make it up the last bit) only to find them shrug and say ‘we don’t have gas’. It was dark, it was really cold. They let us in for tea, and as luck would have it, 20 minutes later the tour agency guys showed up. They didn’t bring gas and acted like they knew nothing about it – even though Drama insisted she had made it part of the deal. It was obvious she was lying. With no options, we grabbed a bag and jumped in with them for the 125 km ride to Calama and left the bus at the top of the pass. We had no money, I had forgotten our passports in the bus and we didn’t know how we could get back to the bus. During the drive, we made a plan. 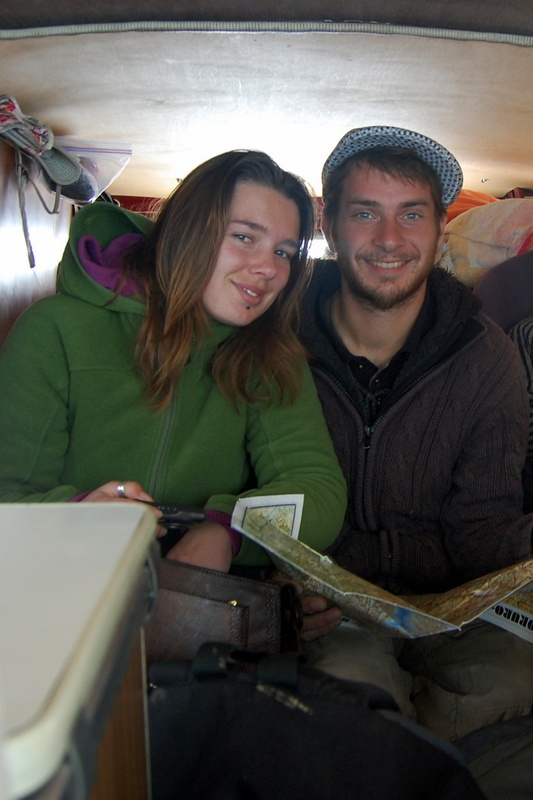 They were dropping off the French couple at the bus station–there were ATMs there. We would catch a cab from there, get a hotel, and a friend of the driver would pick us up the next morning and take us to get gas and back to the bus for about $120 USD. Not a great way to enter Chile, but good enough. your new header shot is straight wicked! Over 12,000 feet up and a gas/water cocktail? I’m surprised Red Beard is running at all. Your every post gets more and more fascinating! Should I be admiring your fortitude or questioning your sanity? Either way, I enjoy reading about your remarkable adventure. 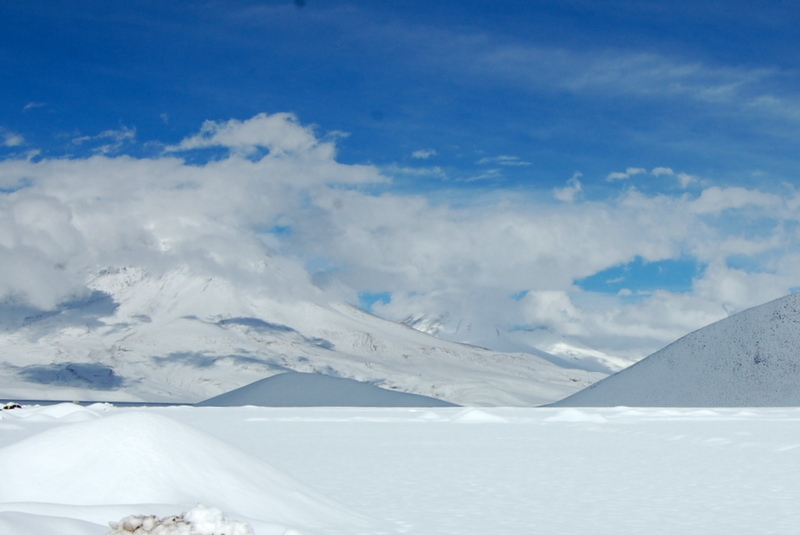 Tree – the Salar after a snow. The Sprinter can do it – but might not show up in the photos! Mitch – c’mon, it’s a VW!